It's been a long time coming, but OddBalls is finally ready for release! I submitted the game to Apple for approval last week, and today they officially approved it. 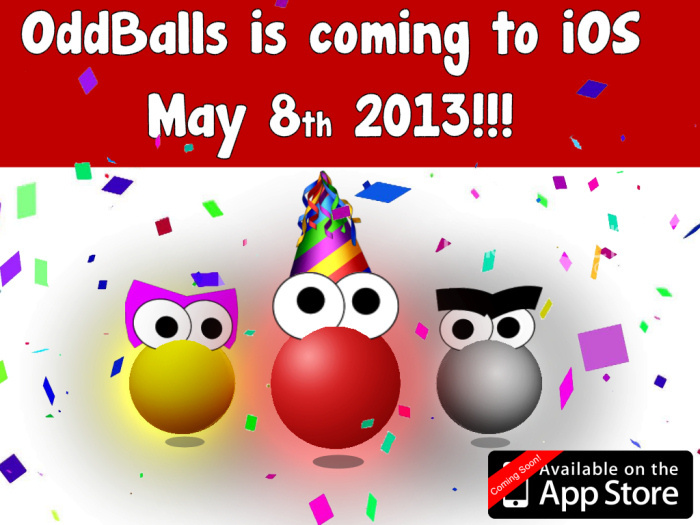 The release date is set, and OddBalls will be available in the App Store on Wednesday, May 8th 2013! I've been setting up various media and press kit information in preparation for this release. There is a new Facebook page for Velvety Couch Games that you can check out and like to receive news and updates about OddBalls. I've also setup an IndieDB profile for OddBalls that includes an HD version of the trailer, and the game has already received some press for the upcoming release. If you would like to post anything about OddBalls to a media outlet, please feel free to check out my press kit for screenshots, a trailer and information about the game.